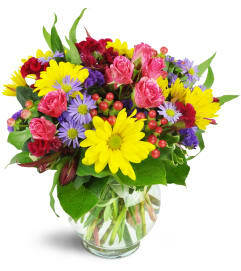 The bounty of the season makes this delectable arrangement a true feast for the eyes! 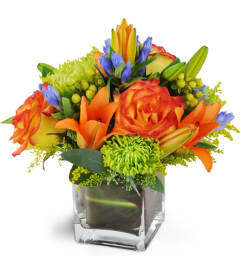 Autumn's palate sparkles with burgundy dahlias and mini calla lilies complemented by the oranges of spray roses and lilies with tender green viburnum berries and vine maple, all in a metallic sienna vase. 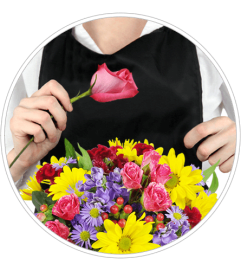 This special gift is at home in the most elegant of settings and it's perfect for any Fall occasion! 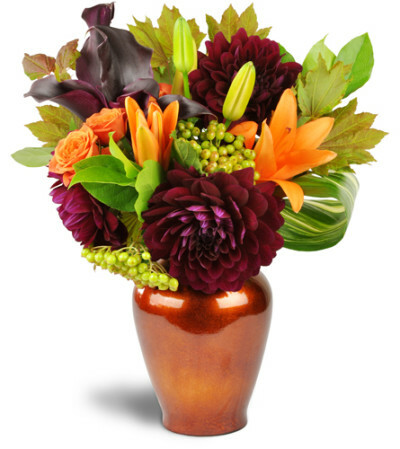 Burgundy dahlias, orange spray roses, burgundy mini calla lilies, orange lilies, viburnum berries, and more are arranged in a metallic dark orange ginger vase.